I am what the Ravelry and Podcast worlds refer to as a lurker. I listen, watch and follow other knitters constantly without ever interacting. Some might equate this with stalking… but that’s just silly. Nevertheless, I am determined to break out of my lurking habits. I may be socially and geographically isolated from other knitters, but in the age of social media, I don’t need to be completely cut off. That is why the new theme for the year is KAL. I love to KAL. All knitters love to KAL. We already follow each others progress on projects, KALS just give us a better reason. When a knitter hears about an up-and-coming KAL, they buy yarn before even knowing what it’s for. Though this may be yet another rationalization for buying yarn, knitters cannot seem to fight the urge to KAL. For the non-knitters in the group [HI MOM! ;)], to KAL is to knit along. These KALs come in many shapes and sizes. There is the pattern-specific where a group of knitters choose one pattern to complete within a set time frame, which will most likely be extended… several times. Then, the ever-popular themed KALs. January might be Finish it or Forget it! while February is Second Sock Makes A Pair. 2012 has been themed as The Year of the Stash Down for many knitting groups. I find that these two KAL options both provide such an opportunity for growth. Pattern-specific? Choose a KAL focusing on a new technique and then ask everyone in the group to hold your hand and practically breathe for you as you make your first cuts to steek for the first time (which I am still terrified to do). Themes? Ultimate stash-down and queue-up opportunity. You may start off feeling proud of yourself for choosing a pattern and yarn you already have, or for finishing that long-awaited second sock. Then you show off your work-in-progress only to find ten more patterns your KAL members are making that you just have to knit! Thus, the endless queue. Often, either KAL choice ultimately leaves your stash bursting at the seams as you watch others knit up yarns that you (clearly) should already have in your stash, but somehow are lacking. Good thing your local yarn shop just received a shipment, Etsy is just a few clicks away, and you have your favorite online yarn shops bookmarked! However, the most important part of a KAL – actually knitting along and interacting with fellow knitters, no matter how many miles away. Knitters who then connect over color choices and combinations, pattern styles, and helping others reach their knitting goals. 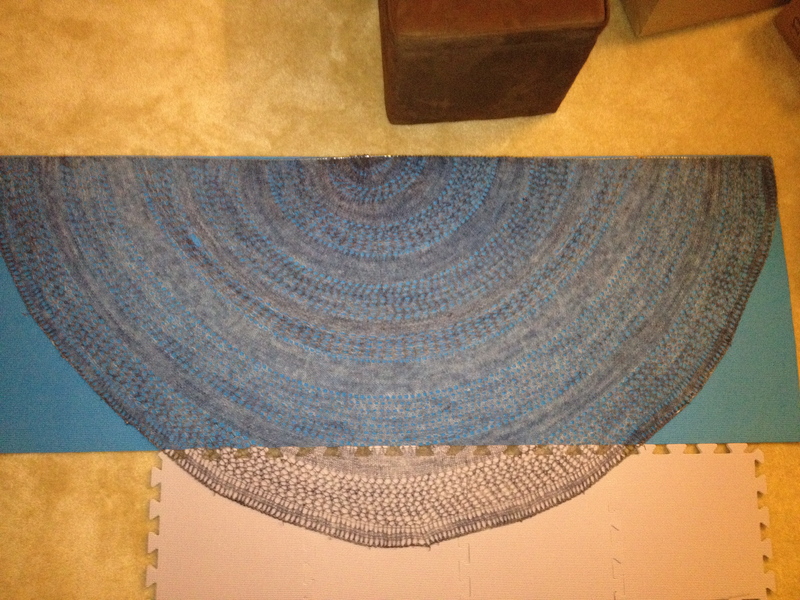 This is the reason I embarked on an epic shawl right after the New Year, only to barely finish by the (extended) deadline. 800 yards of lace weight to create my Thin Ice! This month – my first mystery KAL! It’s too bad this month is the shortest month of the year, all three clues have been released, and I’m still only on the cuff of the first colorwork mitten… it might not be so mysterious for me afterall. But I will, at the very least, post one in-progress picture to the Ravelry board! Maybe. Spinning. Need I say more? After years of hearing of, reading about and now watching others spin and seeing the beautiful outcome, I really had no choice. 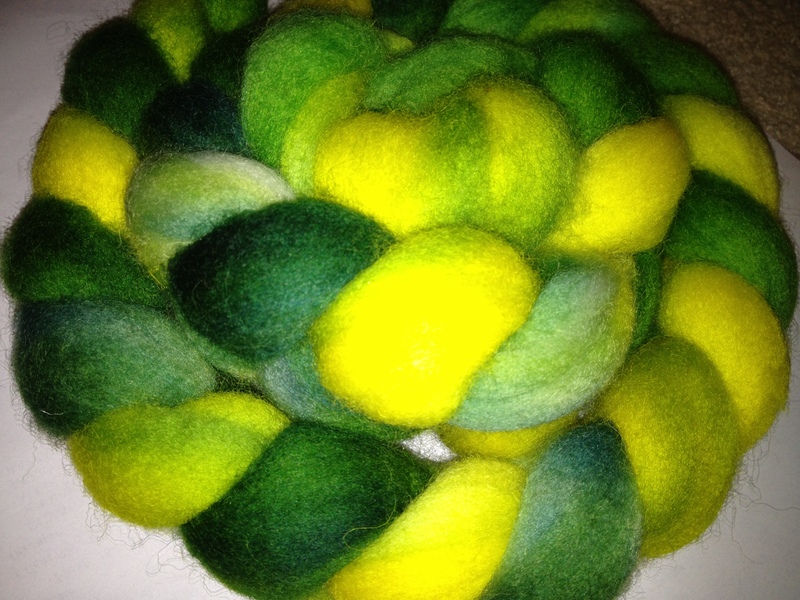 I mean really, I was practically forced into it… by my imaginary fiber arts friends that I hang out with all the time. Okay, truth: I couldn’t resist the idea of how beautifully died fiber could be spun up in so many ways to create a completely different yarn. Whether it be the spinning or plying technique, how new or experienced the spinner is, or if a wheel or spindle was used. There are just so many options. So much to explore. I did ease my way in to this new fiber challenge. I thought about spinning for over a year. I’ve looked at wheels for at least six months. I even did the semi-sensible thing and bought a spindle first. Afterall, a thirty dollar investment is much easier to ignore than a $600 one, especially if it turned out spinning wasn’t for me. Plus, my local yarn shop holds one session drop spindling classes. A perfect way to get my feet wet. I gifted myself a class and enlisted my father to watch M for the evening. Not that I actually waited to take the class before starting. YouTube, you saved my sanity. While waiting impatiently to take the class, I watched videos one right after the other, until I felt the nerve to start. Picked up my beautifully, hand-carved spindle and some variegated green fiber and attacked. 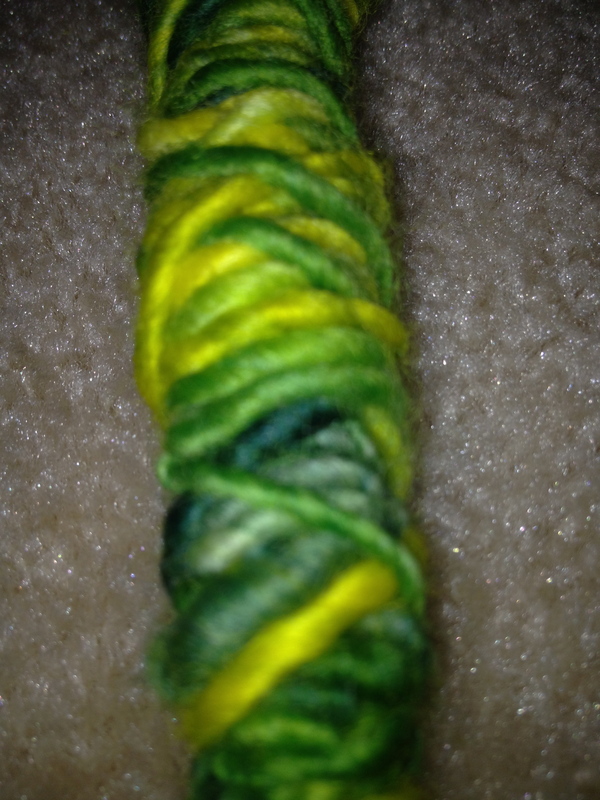 I spun an eighth of my four ounce braid of fiber my first night. I quickly learned that my drafting needed a lot of help, but I was hooked. Literally. I kept snagging the hook at the tip of the spindle on everything. The spindling class was wonderful. We were given/bought with our supply fee a spindle and what seemed like an entire fleece (but really half a pound of fiber is enormous). Since the one-on-one help from the instructor and three days of practice on the gifted (it makes me happier to think of it as a present) wool, I was ready to tackle my green fiber again. I had low expectations for the outcome, but I am so glad to say that, though my single (ie not plied for you non-yarn crafters) is about a sport to DK weight, it is much more consistent and even. Now, what to knit? I’m thinking a green monster that is pathetically constructed and super disfigured… since my yarn will be oh-so-varied in size, shape and twist. It’ll be an heirloom piece for certain. Um, Can I Knit Now??? As a young single mom, I feel like I am constantly struggling to find time for almost, well, everything. I have only been at my current job for a few months, so I’m still proving myself there. Which means getting to work early, working through lunches and bringing home work to do after M goes to bed. Once proven, the workload is still so high, I’ll keep doing this to reduce stress during the actual workday. By the time I can no longer physically stare at my computer before potentially spontaneously combusting, I should have been in bed hours earlier. So when do I get to knit?? Now that M approaches two and a half years, she is more and more aware of what I am actually doing with my sticks and string. However, with her new found knowledge of what making something is comes a curiosity so intense that she wants to rip the project out of my hands and “make” the lace shawl herself. I typically only attempt to knit while she’s awake when she’s eating a snack and/or watching a movie so that I don’t draw too much attention to the knitting and don’t miss out on quality playtime that is so rare during the week. But not much gets past her… so out came the old acrylic. I found a yarn bowl I made in middle school that had scraps of old acrylic yarn that I could give her to play with and pretend to knit next to me. This new technique has given me maybe 15 minutes of knitting a week. So I drag my knitting everywhere. Even the too-large-for-on-the-go-knitting projects make their way back and forth to work everyday (for my mythical lunch breaks), sit next to me in the car during our incredibly short commute (just in case we get stuck at a red light! ), and are never more than a foot away from me throughout the day and night. I am so desperate to get a few stitches in that I have found myself knitting in my sleep! Really, falling completely asleep sitting up while knitting, only to wake up to a surprising amount of progress that I know I didn’t accomplish consciously. Many knitters find a support group. A knit night at a their local yarn shop. There are even a few virtual knit nights out there. But do I join in on any of this fun? Do I designate a time and a place to get some serious knitting done? No, I do it the hard way. I pray for traffic.